Carroll and Carroll, Inc., Savannah, GA, has been in the asphalt business since 1985 and has batch plants in Springfield and Macon, GA. The company makes and lays asphalt and also sells stone. About 2½ years ago, the company decided to build its first recycling plant. One of the priorities for the new reclaim plant was a reliable, low maintenance size-reduction impact crusher that could handle the abrasive granite. They began checking out other reclaim plants and learning what granite crusher worked best for them. Photo, Kenneth Pate, President of Carroll and Carroll, Inc.
Carroll and Carroll purchased a Grand-Slam™ HSI, Horizontal Shaft Impactor, Model 3030 with a maximum capacity of 30 TPH for the new reclaim plant. They’ve had no regrets. Since installing the Grand-Slam™, they’ve put about 125,000 ton of product through the Stedman Grand-Slam™ Impactor at a cost of about 3 cents per ton. Photo, Carroll and Carroll Inc. plant. To process the amount of product it does at a low cost per ton, the Grand-Slam™ operates as both a primary and secondary crusher. The two-stage crushing action allows the Grand-Slam™ to deliver up to a 30:1 material reduction for more spec size product the first time through. The increased crushing capacity means the circuit runs more efficiently, reducing operating costs. Featuring variable speed drive, product size changes can be made on the fly without stopping production. Photo, Close-up image of Grand-Slam™ 3030 impact crusher. The company pushes the Grand-Slam™ hard. 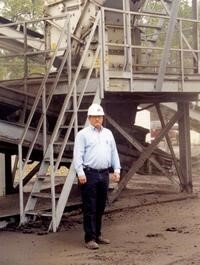 “We run the crusher 8 to 10 hours a day non-stop. It is a real performer on the very, very abrasive granite we’re processing. It eats anything I put in front of it,” Morris said. “We don’t have any waste and we don’t have any rejects,” Vincent Morris, plant superintendent Carroll and Carroll Inc.
Carroll and Carroll also like the fact that the Stedman is low maintenance. Equipped with high-chrome blow bars that deliver up to seven times the wear life of manganese bars, the Stedman Grand-Slam™ doesn’t require a lot of maintenance. “In the 2½ years we’ve had the Stedman crusher, we have only had to have 4 sets of breaker bars. If you do routine maintenance and take care of the hard face, the bars will last,” Morris said. 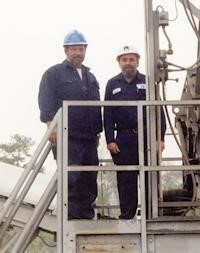 Photo, Bill Harrin, Foreman and Vincent Morris, Plant Superintendent at the Carroll and Carroll Plant. When maintenance is required, rotating or replacing the breaker bars is quick and easy. Both front and rear housing are hinged and once open allow unobstructed access to all areas of the crushing chamber and rotor.